What could the larger role of digital be in a customer journey and how an airline can make use of technology to enhance customer experience? Even before the celebrated First Step in every journey, it all beings with a want or a need. The triggers for want to travel could social media, friends, recommendations, interest, etc. The need to travel (especially air travel) could be based on convenience, speed, option (or lack of it), etc. Be it a want or need, the natural progression of satisfying the want or need would be to search for the best available options - either a travel website (trip advisor), OTA websites, search engine recommendations, etc. Not to forget the emails and WhatsApp chat, etc., with friends and family along the way. The cookie based (re)targeting, dynamic and customized communication, etc., are effective ways of keeping the user engaged. 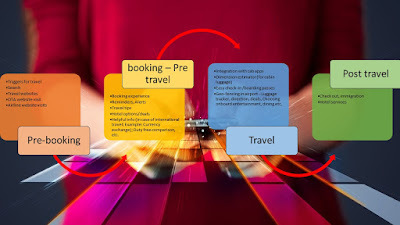 The user experience during booking (through website or app) is something that most businesses have focused on and got it right to a large extent. The search, choice, and purchase are seamless in most instance. Even small things like, the passbook (iOS) integration are helpful. In fact, in some instances, you can book a flight ticket under 2 minutes! Airlines could go a step further by having strategic partnerships with hotels, banks (currency exchange/ travel cards, etc.) to help their customers have a seamless international travel experience. Even non-basic stuff like Duty Free comparison would be a helpful option as part of customer experience. The only thing that I see most airlines offer currently as part of travel stage is the web check-in. There is huge opportunity to enhance customer experience in this stage. Right from integrating with a cab aggregator for airport drop, to cabin luggage estimator (dimensions would be easy, but knowing the weight will be helpful); Using NFC, Bluetooth / Beacons, IoT, technologies we can create geo-fencing inside the terminals, integrate digital signages, luggage/baggage tracker all can enhance the travel experience. Enriching the experience further could be airport terminal shopping experience - best deal offers, getting to choose the on board entertainment, cuisines, special requests…all can be handled using technology. The check-out services like visa (on arrival), immigration services is a useful feature as part of the traveler's journey. The experience can end on a high note by helping the user hail a cab to the hotel/destination where they want to go. It is high time airlines look at reinventing the way they see a 'customer journey'. Airlines should aspire to be Starbucks, by being in the business of experience than just selling a travel option. Delivering a good customer experience is a challenge, but technologies are making it feasible and affordable. What do you say? Do you think you'd love to see an airline offering such an experience?? Love to hear your thoughts on it.